WHAT SHOULD I BUY? Whenever I decide to buy something for myself or the house I try to research the item as best I can. I don't trust many of the product reviews I read because they are probably paid reviews. On this site I review products and services that I ACTUALLY use in my everyday life, in hopes it will help others trying to decide what to buy. Please feel free to join in and add comments or ask questions. 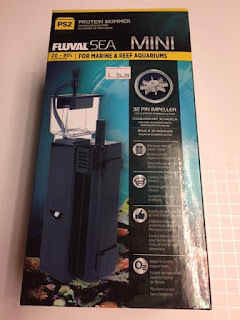 After having no luck with the Coralife Biocube protein skimmer, which I had posted about earlier here, I purchased the Fluval Sea PS2 Mini Protein Skimmer for my Biocube 29. I had researched this skimmer online and found nothing regarding whether or not it would git into my Biocube. According to the dimensions from Amazon.com I was quite sure it would fit into my tank, so I bought it from my local fish store, Marine Oasis. After opening the package and inspecting everything I attempted to fit it into the 3rd chamber of my Biocube. Finally after about an hour I manged to tentatively fit it in, even though it was a bit wobbly. It seemed to work okay, but each time I opened the lid or did water changes the position of the skimmer would change. After a number of attempts to relocate it I thought I had the perfect fit. It began to produce a skimmate which I thought meant it was working fine. Unfortunately I was wrong. One morning I smelled something burning and found that the skimmer had overflown and blew the collection cup lid off and was spewing water onto the wall in back of the tank. This ran down the wall and hit the electrical socket causing smoke and sparks. Luckily I was able to disconnect everything avoiding a potentially disastrous fire. Even though I had protective loops in all of the electrical cords it did no good, as the water ran down the wall and not the cords! After a week or so I replaced the power strip and emailed Fluval customer support, explaining what happened and asked if they had any suggestions. They basically told me to read the directions, which of course did not have any information regarding my situation! Finally I managed to fit the unit into the second chamber of my tank, where it has been for more than a week and working well. This protein skimmer does not have a wooden airstone, but a propeller driven system to produce bubbles, which saves a bit of money. So far the Fluval Sea PS2 Mini Protein Skimmer seems to be working fine, after many adjustments. I believe this product is a good buy for nano tanks under 30 gallons. But before you buy it please do your research as I don't feel Fluval's customer support is very helpful. I bought this unit for less than $60, which is much cheaper than many protein skimmers on the market. The reviews I have read on Amazon and other sites highly also highly recommend it.